With September near I guess I must start thinking about school again. So here we go. A nice way to start the year is to have the students think about the type of year they want. With this project I get them to think about role models. Who are the role models in our society and who are their personal role models. I start by have the students think about the role models in society whether it be politicians, or athletes or any other role model. We then brainstorm traits that those people have in common that make them role models. What are some traits that make a good role model? Next I have them decide who are some of the role models that they personally have (parents, brothers, teachers, actors etc.) I then ask them to write down the traits that those people have that they admire. The students are asked to have reasons why that person is a role model. For example I had a male student who named Megan Fox as his role model because she is "hot". He then had to come up with other reasons and prepare for a paragraph and discovered that Megan Fox was not really his role model. Through some discovery though he found out about some of the charity work that she does which opened his eyes a bit. I also had a student who chose a celebrity from a show he liked and after some research he found out the person wasn't as good of a role model as his grandfather who demonstrated many of the traits he found important. For fun I have the students then get a picture of their role model and they will use it to become that person. At the beginning of each year I take pictures of all my students and so they combine the two pictures using their head and the persons body. If you enlarge the head a bit you can make it look like a bobblehead and the effect is quite fun. The student design a background that would be suitable and write a paragraph about why this person is a superstar in their mind. I display this on the wall of the classroom and the students really enjoy it. 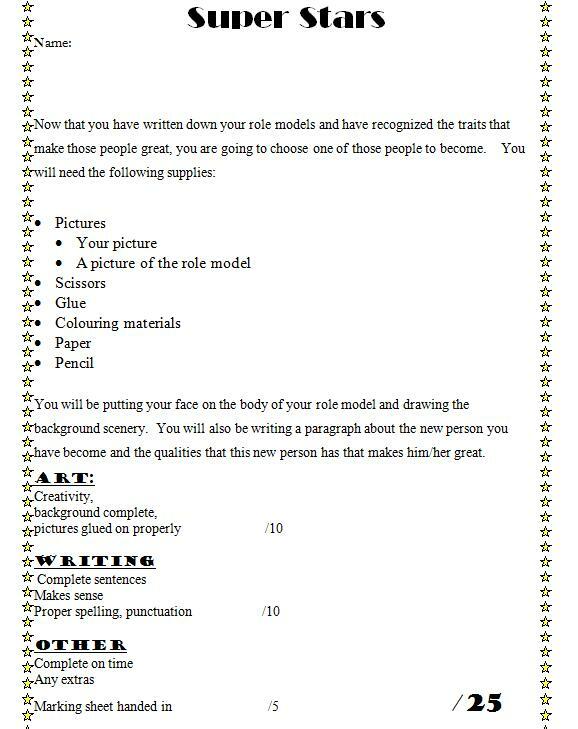 I have also extended this project by adding a goal setting component where the students use the traits that they think are important to make short term and long term goals. If I can find some previous examples in my room I will post them. Hope you enjoy. 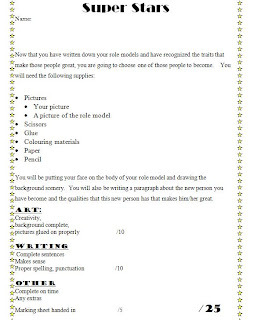 You will be putting your face on the body of your role model and drawing the background scenery. You will also be writing a paragraph about the new person you have become and the qualities that this new person has that makes him/her great. 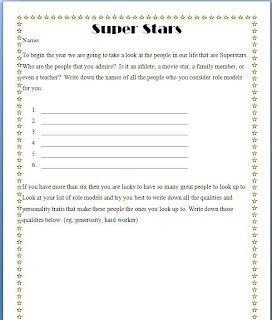 To begin the year we are going to take a look at the people in our life that are Superstars. Who are the people that you admire? Is it an athlete, a movie star, a family member, or even a teacher? Write down the names of all the people who you consider role models for you.